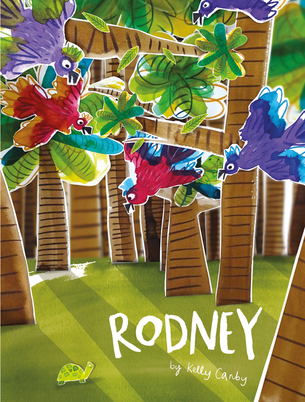 Rodney is a children’s picture book written and illustrated by Kelly Canby, published by Fremantle Press (2019.) RRP: $Au 24.99 HB. I have previously reviewed Canby’s The Hole Story. Rodney spent most of his days looking up. Imagining, for hours, what a life high among the treetops would be like and how it would feel to be so … tall. Kids know what it is to dream big. They will certainly relate to Rodney, a tortoise who is tired of being small and wishes for greater things. In a fairly simple narrative arc, Rodney interacts with various lofty creatures, all of whom encourage him to join them up high. But climbing is not in the tortoise skillset. Canby's artwork is nothing short of spectacular. I loved the 3D effects, the atmospheric vegetation, the colourful riot of birds, the collage, and the textures throughout. With the theme one that is centred around perspective, it is great that Canby shows us so many different perspectives in the illustrations. Rodney is such a visually beautiful picture book. I recommend it to libraries and schools everywhere, and it is certainly in contention for my Top Children’s Picture Books for 2019. There are teaching notes available on Fremantle Press’s website. Rodney might also make an interesting picture book for children to compare with Rodney Loses It by Michael Gerard Bauer.